John will be going to Kadawa January 6 to see how things are going and to get some new things into motion. Jeremy Bell has just left there and has been reporting regularly about the projects and also has sorted some issues out. He has taken several photos that are so exciting to us. We'll share some here. (We also have plagiarized some of his reports. The Lord truly has taken care of the farm this year and, once again we must praise Him for Johnfred, who has done a masterful job while we are away. The widows' farm crop is one of the best we have seen with many of the stalks having 2 cobs. 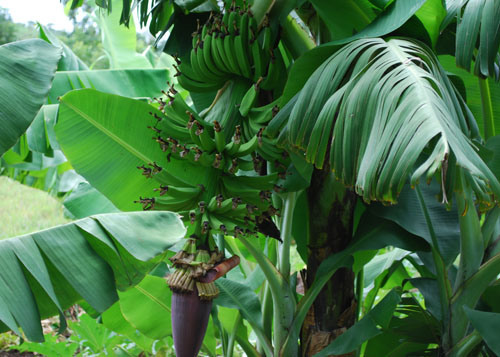 There are beans planted in-between the maize, there are bananas on the bush and squash growing underneath them. Management and timing is everything. (Johnfred ordered the tractor to plough for planting back in Sept. The way the schedule for the tractor was working it wasn't going to get there until into the rainy season, which would make it impossible to plough. We prayed and the tractor guy came early and got the field ploughed twice.) The tractor came back 2 weeks later to plough the church land but the ground was already too wet by then so they have had to rest the land this season. There is also a small veggie patch that you can see from the top photo, which will provide food for widows, but those and the squash under the banana's are also cash crops; the money to be used for medical transportation and related expenses when a widow must go to the city for treatment. Once we get our own tractor ploughing will no longer be a problem for the farm or for the church. Plus it will provide income for the farm by ploughing other peoples' fields. God will provide it, and take care of us in the meantime. That's for sure!!! The water tower is painted red and white to warn approaching aircraft. (We are still trying to figure out why a plane would be low enough to see the red and white.) It's beautiful! The final stage of this project is to pump water from the well into the 10000 litre (2200 gallon) tank. With the data we get from Jeremy, John should be able to get that part of the project going when he is there in January. During the rainy season there was a violent wind that blew so hard that the empty water tank blew all the way across the platform. But for the railings the tank would have blown to the ground and been destroyed. Johnfred has secured it tightly with ropes on all sides, but it is vital that we get water into that container. Once we get the pump, generator and associated paraphernalia to get the water up there, we will be able to irrigate the crops regularly during the dry season and will have outstanding yield. 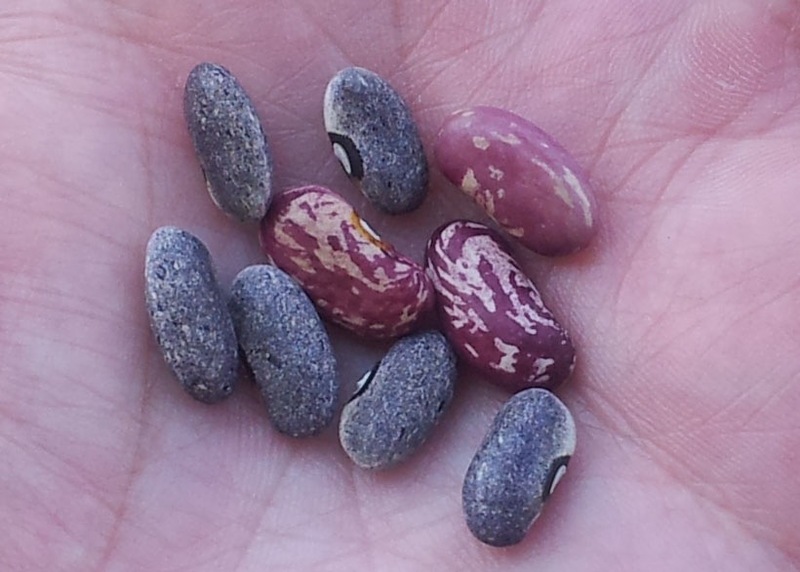 There was only one kind of bean planted when the crop was put in, but two different kind of beans were harvested! It was a good crop! They are planted in furrows between the maize crop and harvested shortly before the maize. 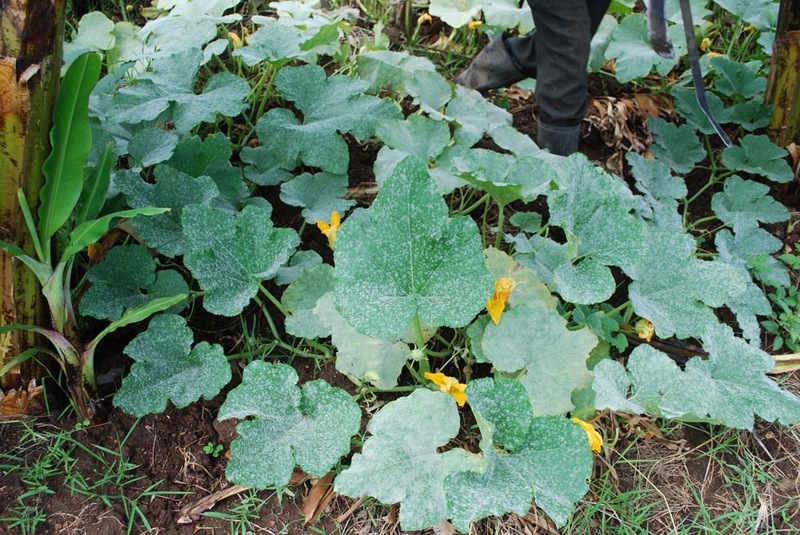 There are two crops a year in Kenya, one that is planted before the "former rain" and one before the "latter rain". Yes, just as in bible times. In villages, getting a good crop depends upon rain - at the right time and in the right proportions. Therefore, if there is drought or if there is an excess of rain at a critical time in the growth process, there is little or no food. 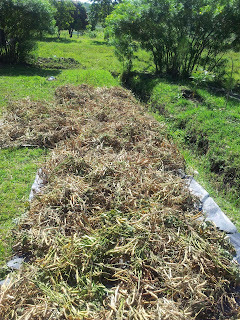 It is now near harvest time and many folks have no maize or beans left from the last harvest. When this happens the price for these commodities goes up at the native market. 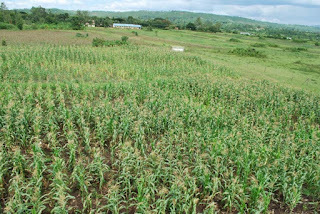 Maize, when it is plentiful, sells for 40 to 50 shillings per 2 KG tin (4.5 lbs. ); now it is selling for 70 shillings per tin. Many people cannot afford that; especially, destitute widows. 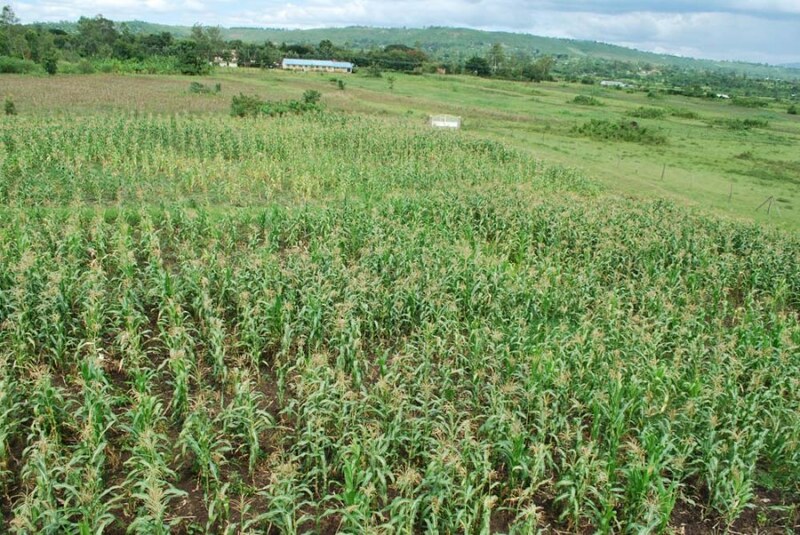 We save much of our maize and bean crops to distribute when times are difficult. 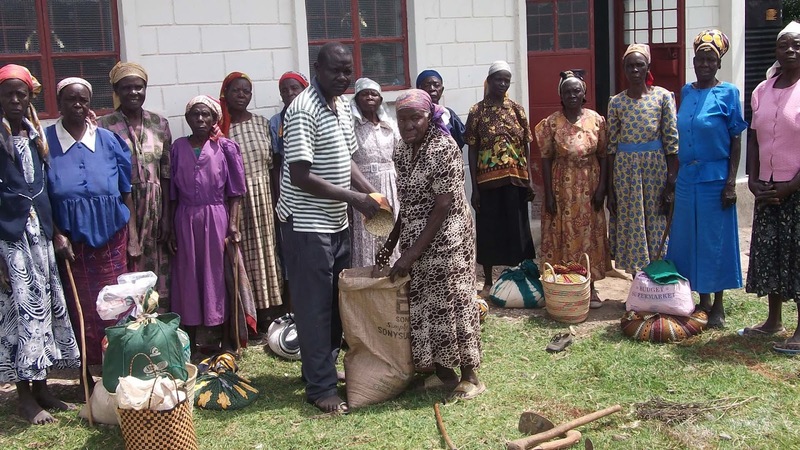 Last week we were just able to distribute 10 KG to the widows. We were in a coffee shop a few weeks ago when we "accidentally" came across an article about bone-marrow transplants being successfully used to cure sickle-cell anaemia. After some research, with the help of a doctor friend and the Internet, plus a phone call to Johns Hopkins Hospital in Baltimore, Maryland, we have found that bone-marrow transplants in children with sickle-cell anaemia have very high rate of curing the disease. (It doesn't work so well with adults because the disease has had a long opportunity to cause irreparable damage to the body's organs.) Also, the possibility of finding a donor with a 100% match is high if the child has siblings. Imani has four! We have learned of mission teams going into Kenya and doing bone-marrow transplants; teaching national doctors the procedure. We have contacted two doctor friends who are checking around for us to see if they can find anything about such teams. We can't find any doctors or facilities within Kenya (yet) who do that procedure, but when John goes there in January he will do some checking around. That's the latest. It certainly is a ray of hope. We believe that the Lord has His hand in this child's life and has a plan for her future. We are trusting Him to open doors and also to give us Divine thoughts and strategies regarding her healing. He is the God of the impossible!!! WE WISH YOU A VERY MERRY CHRISTMAS AND A HAPPY, PEACEFUL, PROSPEROUS, HEALTHY NEW YEAR, AND MUCH BOUNTIFUL GRACE! 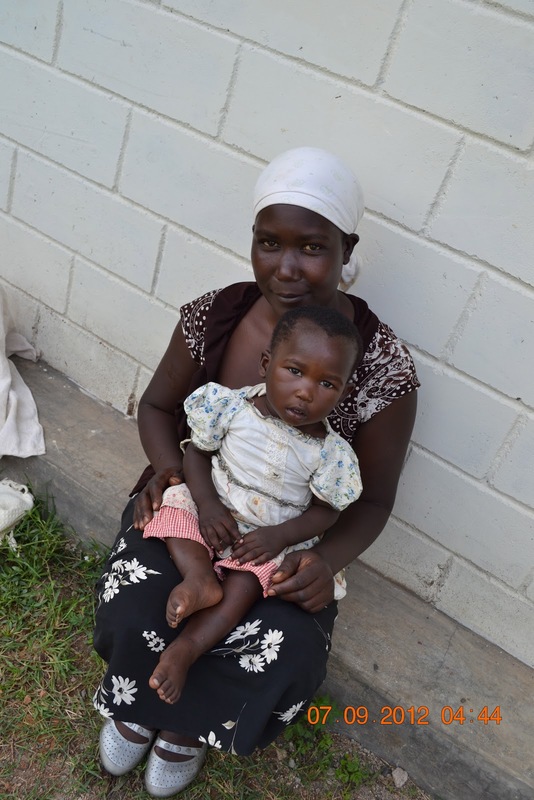 In the beginning of August we asked a specific prayer request for a one-year-old baby girl named, Imana, and her mother and father - Elizabeth and Samuel. She had been diagnosed by doctors in Kisumu - the city/town where we stay when in Kenya - as having a hole in her heart. She is very weak - hasn't been able to learn to walk because she is too weak to make the effort - is pale by Kenyan standards and has had two blood transfusions in her short life; she is listless and sleeps a lot. The doctors in Kisumu refused to treat her any more, saying she had to go to Nairobi to heart specialists there who were more qualified to handle her condition. Hesbone, through contacts in Nairobi, was able to make arrangements for her to be seen the end of July by a Nairobi heart specialist who was coming to Kisumu. The day came, but the doctor didn't. Let us interject here a bit of the culture, and how if effects people: These type of things are normal in Africa. They are part of the frustrations that we face regularly in the culture. Villagers don't seem to get upset by the constant delays, broken promises, no one showing up or calling, last-minute cancelled appointments, waiting for hours, etc. That is what they have known their whole lives - they haven't experienced any other way of living. Then, going to Nairobi (about 250 miles and 8 hours away) is a very difficult and complex thing for a village person. They have little or no experience with long-distance travel - often have never gone more than 15 miles from home, if that far. Additionally, there is no place to stay. Of course, the MAJOR issue is lack of money; not just for transportation, accommodation and food, but for treatment. To be seen by a doctor in Nairobi could take many months. In fact, even after the appointment is made they could get there to the hospital and wait, only to be told to come back - without having been seen. Meanwhile the patient becomes more ill and, in some cases, dies. 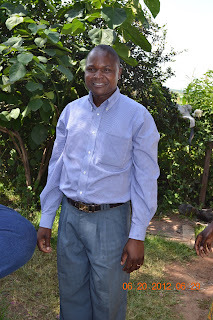 Hesbone was formerly the financial administrator of a major hospital in Nairobi and he was able to use his influence to get an appointment for Elizabeth and Imani; additionally, she was able to stay with Hesbone's brother and family in Nairobi. Samuel remained in Kadawa with the four other children. After being hospitalized in Nairobi for several weeks, Imani was recently discharged. However, all this time she had been misdiagnosed. Her heart is sound - no hole in it. But she is seriously ill with a disease known as Sickle Cell Anemia. Elizabeth and Imani will have to return to Nairobi for ongoing tests and treatment every two weeks. This presents nearly insurmountable odds for them. They will do this for one more month, and meanwhile Hesbone will try to make some kind of arrangement with the Nairobi specialists to have tests and treatment made available in Kisumu. Sickle cell anemia is, briefly, a disease of the red blood corpuscles, causing some of them to become malformed into the shape of a crescent or sickle. Some of these blood cells become sticky, and that and their shape cause them to clog up various blood vessels, etc. For all intents and purposes, it is incurable. A cure is possible, through stem-cell or bone-marrow transplants. But this is highly unlikely. The successful search for a donor with a positive match is very rare, and patients in Africa are highly unlikely to be able to afford such a procedure. Symptoms include: Fatigue, paleness, rapid heart rate, shortness of breath and jaundice; all of which Imani displays. Over time, the spleen no longer works and as a result other major infections occur. People with sickle cell anemia are especially susceptible to malaria - a rampant disease in Kenya. Cause of death is usually organ failure and/or infection. IMANI TRULY NEEDS A MIRACLE. THAT IS THE ONLY SOLUTION TO THIS DILEMMA. PLEASE PRAY FOR A MIRACLE FOR HER AND THE FAMILY! Without a miracle she will die - painfully. Our hospital fund has paid all of the related medical expenses for the family - which by Western standards is nothing, but by the standards of a beneath poverty-level Kenyan are unfathomable. Her expenses were $393 (250 GBP). With the treatment of many other patients, the hospital fund is depleted and we want to continue to help meet this baby's needs, and those of other people, as best we can. All of you have continually been generous with the various projects that we report on through our newsletter and talking with you. The Lord continually supplies the needs through you. We merely let you know the needs, and leave the rest to Him. THE WATER TOWER IS DONE!!!! YAAAAAY!!!! Now for some positive news. The water tower on the farm is complete!!! What a major engineering job it has been. Really! We hired an architect and a structural engineer to see that it was done properly. It is a wonder to behold! AND 85% of it has been done without us being there. Johnfred has faithfully managed the whole procedure and kept us informed every step of the way; with accompanying photos. We opened the e-mail showing the completion of the main structure while we were in a coffee shop. When Marty saw it she was so surprised she began to cry (quietly). Do you remember that we asked you to pray that the small, impassible road at the bottom of the farm could be made useable? Well, Johnfred did it! He engineered all the needed repairs and the truck that delivered the water tank to go atop the tower drove through the gate with that big tank on it. Johnfred sent us a photo to prove it, for our John was just not sure that the truck and tank would fit through that gate even if it did get down the road. And now all of the villagers in the area are very happy with us for opening the road for them. The next step is to hook up the tubing for the drip irrigation system that we intend to use to get good crops even when there is drought. We will eventually get a pump and generator to get the water from the well into the tank. The well has continually been full even in drought. WE HAVE A FARM MANAGER!!! For around two years we have been praying for a manager for the Widows Farm; a person who could supervise and help the farm and associated projects. We have found him!! Yes we have!! We are delighted to introduce you to Johnfred Ajwang, his wife Lydia, and their four boys. In July 2012 Johnfred accepted the position of Widows Farm Manager to help us develop the vision on the farm and associated projects. He will work part-time in this position. 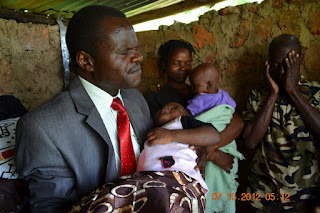 Johnfred is pastor of Restoration Community Church's (RCC) new daughter-church in Kadawa. We have already seen the enormous benefits of having Johnfred in this position as we develop the infrastructure of the farm. For example there are some small things that we have been attempting to do for two years and Johnfred managed to have them done within two weeks of beginning to work with us. 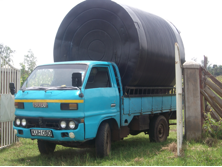 He also devised a simple, efficient solution to a problem we have had with access to the farm, and now we can get into it relatively easily with a truck. We couldn't do that before. He has tremendous initiative and already has a real heart for the land, the projects and the future vision for the farm. 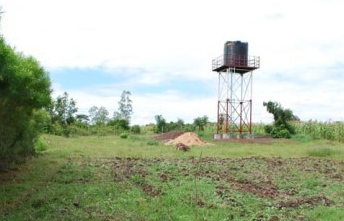 One of the prayer points in our last newsletter was that the water tower be completed before we left. Due to some serious complications that wasn't possible. But, we have left Kenya with a real sense of ease and security, knowing that the project is being well-supervised by Johnfred and will be properly completed. We have already received photos of the progress. Wow! Johnfred was born 40 years ago in Tanzania (pronounced Tahn ZAHN ya). When he was two years old his father died and when he was three his mother moved to Kadawa, where he was raised. Lydia was born in 1975 in Embu in Eastern Kenya near Mount Kenya. She and Johnfred met in 1998 when he was ministering as a teacher/trainer with Life ministries, formerly known as Campus Crusade for Christ. They were married November 15, 2002 and have 4 boys, Shem Favor 9; Enock Bruce 8; and twins Ruth Heri and Japheth Jabali who are 3. BTW - Heri is Swahili for Blessed and Jabali is Swahili for Rock. After leaving secondary school Johnfred trained as a mechanical and auto engineer, specialising in diesel and petrol (gasoline) engines. At one stage he was employed on an Asian farm in Kenya where he overhauled and maintained the farm equipment and vehicles. In 1994 he became a Christian and, one year later, joined Campus Crusade for Christ where he became a trainer in the areas of evangelism, discipleship and leadership training. 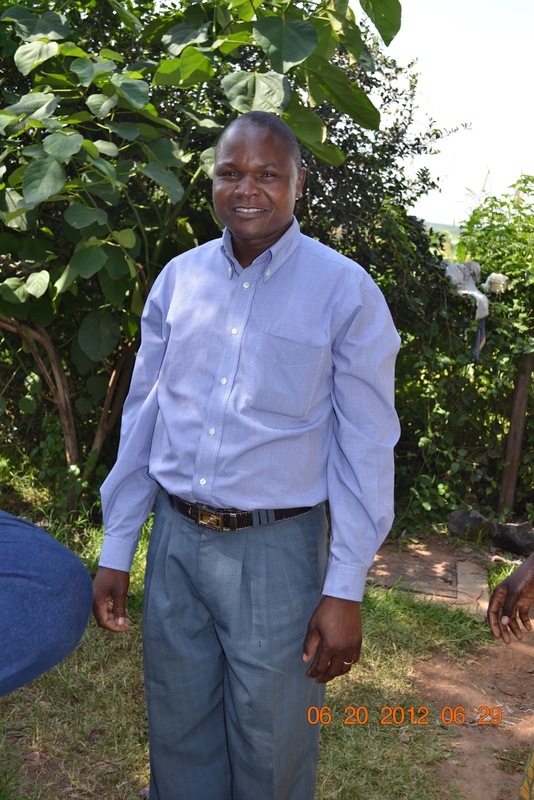 In 2004 he became assistant pastor at his home church specifically in charge of “outreach”, but in 2006 rejoined Life Ministries to work in Western Kenya. As an area leader his ministry involved showing the Jesus film, training church leaders and organising holistic projects for widows; such as, starting microfinance projects. After the election violence in 2008 support for Life Ministries dwindled and he was forced to leave that ministry. In 2009 he returned to live in Kadawa village where Lydia is now a primary school teacher. In 2010 they joined RCC and at the same time he determined to finish his biblical studies. In Aug 2011 at a Dove conference in Nairobi he realized that God was calling him to be a pastor. Then in February 2012 he and Lydia were assigned to start the new RCC daughter church in Kisumu. His theological studies include: Advanced Certificate in Christian Ministry; Diploma in Biblical Theology. Currently his educational training involves spending 5 weeks, three times a year in bible school in Kitali, Kenya. This will last for another two years. Lydia is the daughter of a pastor. She has 3 sisters and a brother. She is a primary school teacher specialising in Religious Education, Science and Math. She has a vision of continuing her education and becoming a headmaster. She also has vision to see the new church-plant develop and mature. She is an intercessor, and her giftings include training children in church. She is recognised as a “woman of faith". RCC in Kadawa can only support its pastors minimally because the church is growing and reproducing so rapidly. Therefore the pastors of the new congregations have to involve themselves in “tent-making ministry”; i.e., they must also have outside employment to sustain themselves and their families. We have determined to give a monthly salary through raising support for him and his family until the farm becomes self-sustaining, at which point his salary will come from farm profits. Sunday night, July 22, thugs came to the church and attacked the night watchman, tying him hand and foot and taping his mouth after forcing him to give them the keys. They put him in the kitchen, which is a separate room from the church, accessed from two outside doors. then they proceeded to haul out the keyboard, amplifiers, mixer, microphones and even the new tent that was purchased for evangelism and other outreach events. They stacked them on the porch waiting for a truck to arrive. Meanwhile, Jared, the night watchman, was able to get his hands and feet free and escape un-noticed through the back door. He ran to a nearby clinic that had a night watchman and they began to shout, blow whistles and make as much noise as possible to alert the neighbourhood. When the villagers hear this, they know there is trouble and they begin to broadcast to their neighbors and from near, far and wide people come running - with spears, pangas (machetes), bows and arrows, rocks and anything else that would be a weapon. When the thieves heard this racket they fled, leaving everything where they has stacked it. Not one thing was stolen. Additionally, Jared was unharmed. The chief was immediately contacted and the police brought in, and it is hoped that the perpetrators will be apprehended. Wahoo! Don't mess with God's stuff or His people. We were reminded of the bible story where Apostle Peter was in jail, chained to two guards and God supernaturally released his bonds, opened the cell door and had him personally escorted out by a big angel; all undetected by the guards. Jared hasn't mentioned any angel, however we all believe it was a miracle that he was able to get loose from his bonds and escape undetected, but he readily confesses that God protected him and he is very grateful. We were talking about the attempted robbery with a local friend, a Kenyan national, a few days later. He asked us if we knew why the thugs had really fled so quickly. He then explained that the people of this area of Kenya have no confidence in the legal system, which is rife with corruption. Frequent experience has shown that if the thieves were arrested by the police they would be freed through the payment of bribes. So the populace will sometimes take the law in their own hands. The common punishment inflicted by the mob is so terrible that we won't write about it but needless to say, it is a real deterrent to crime. We have heard the term here of "mob justice", in fact one of the students asked Joshua - the young policeman from Florida - how mob justice is handled in the USA. But he answered that it wasn't something that had to be dealt with as a rule. So now we know what "mob justice" is. There is no wonder the thieves fled. We continually learn amazing things about this culture. Johaz, our night watchman at the Widows Farm - or "soldier" as they are called here - actually uses a bow and arrows for his weapons as he guards the farm at night. Now I'm not certain what he could hit with this bow and these de-feathered arrows, but if you look at those arrows you will see they are serious. Bows and arrows are watchmen's weapons of choice, for they can reach their victim at quite a distance. Check out the barbs on these arrows. Ugly! We were at the farm a day after the incident and our farm manager saw the bow and arrows were out in plain view - we were working in the watchman's room - and said we should put them out of sight, for we didn't want people to see the weapons our man was using. I explained they were out for a photo. He then suggested we get the watchman a better bow. Since this one is obviously a not-so-good homemade rendition. We asked where to get one (it didn't seem like something you'd stop in any store in town to pick up) and he said that there are many Maasai in town that know how to make a proper bow, so he would go into town and get one from a Maasai. (As one does!) We asked the cost. And he said it wasn't the sort of thing he was accustomed to buying, so he didn't know. The watchman stopped by later to tell us his gumboots size (farm boots or Wellies- he asked for them for when the weather gets wet) and I wish you could have seen his reaction and his face when we had someone tell him we were going to get him a Maasai bow. When we get it we will show a photo in the next blog. Now, as to the arrows - our farm manager - Johnfred - said they are made by a blacksmith. He didn't mention whether that included the shaft & feathers. We'll find that out later. If you look closely at those arrows you can see how they are done all by hand. One of the shafts appears to be bamboo. Our lives get more and more interesting and exciting. We learned something new about black mambas - a seriously deadly snake that lives here. Let me stress that we have never come across any snakes here. Although, once when the women were working in the maize field they did come across a baby black mamba - which had a very short life - and whose body was unceremoniously dumped down an ant mound. If it had been left out in the field, even the bones would have poisoned someone who might come across it. What did we learn? Well, we were traveling in the van with the American team along a very narrow road that was heavily lined with large bushes that scraped the vehicle and the branches came into the windows. Our driver told us to close the windows to keep the snakes out. We thought he was kidding. But he told us that snakes could be in the bushes and jump into the vehicle. We quickly closed our windows until the road was wider and less bushy. We later confirmed that Black Mambas sometimes climb bushes and they, as Hesbone put it, like to come into places like cars and vans. We have since not forgotten that lesson and quickly roll up our windows if we think it necessary. We have witnessed baby dedications at two different RCC churches while here this time. In a few respects there is a stark difference to baby dedications in the West. Along with the other customary instructions and responsibilities, Hesbone emphasized to the parents of the babies that these children are now dedicated to the Lord and now they belong to Him. He STRONGLY emphasized that from that point on the parents were never to take their babies to a witchdoctor for any reason! If the child becomes I'll the parents are to pray for the child and seek professional medical treatment from a doctor where necessary. He emphasized that doctors,medicine and hospitals are provided by the Lord. Another difference is that when praying over the child during the dedication the pastor breaks any ancestral curses over the baby or any curses through any other means, and any evil spiritual influence or attachment to the children. We found it very interesting and touching at the recent dedication that when Hesbone took each child in his arms to bless it and dedicate it, even one about 3 years old, they were all very quite at ease and peaceful. We have gone over the list of folks who have been helped by the hospital fund that has been generously provided for by several of you. We are so blessed to list a few of them for you. * Mariko - Surgery for prostate cancer is pending. * Christine - Surgery to remove a massive keloid and give radiotherapy to prevent its recurrence - restoring her life to normal after a long period of incapacitating pain. * An epileptic child who is now seizure-free due to medication. * A pregnant woman with advanced preeclampsia. She came to the medical clinic where staff diagnosed her situation as critical. We sent her immediately to the hospital. The unborn child had been dead for an extended period. The child was delivered and the woman surgically treated, given antibiotics and hospital care. She survived and is home and well and has given thanks that she is alive. * Two infants suffering from malnutrition - one close to death - sent immediately to hospital. quite awhile, but is home and well. * Irene, who had fibrous cysts in her uterus which were removed and she is recovering. * Lydia - a little girl who had sever wounds all over her legs. A visit to a distant dermitologist for treatment proved successful and her legs have healed well. Her skin is dry and a bit discoloured, but creams should remedy that. * Approxomately 35 successful cataract surgeries have been done, restoring sight and renewing the lives of people who had limited or alomost no vision. ministry, and the specific project to which it is to be applied. WE WISH YOU GOD'S RICHEST BLESSINGS! ﻿﻿﻿ What, you may ask, is a gospel house? Well, our team helped build one. We have shown you house-building photos before, but this is a truly unique story. To begin with, it was for a man - a first for us. The leadership team of Restoration Community Church﻿ (RCC) makes the decisions regarding who qualifies for a house; that relieves us of the responsibility. The man they chose, David, is an older man who is a bachelor. He lived in a tiny one-room mud house with a very leaky straw roof, on a compound with some male relatives, but they didn't want him there. He has been a social outcast for many years. Why? Because he was mentally unstable. Through circumstances he began to come to RCC. He heard and understood the Gospel Message of coming into a personal relationship with Jesus Christ. He accepted that as the truth for his own life and not only did he experience a change of heart, but his mind was restored. He became rational. Because of his very poor living conditions,his age, his social status, and the radical change in his life, the decision was made to build him a house as a testimony to his neighbours and neighbourhood area, of the effect of his new life and relationships. 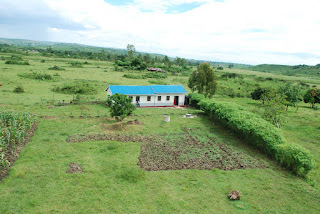 He was able to get a piece of land not too far from the compound where he stayed, and the team from Florida and his cell group (home group) went there to build his house. It is a good sized two-room house and the view overlooks a great valley of beautiful bush and forestry. It is so peaceful and beautiful there! Of course the women cooked a couple of great meals so that the workers would be sustained and also, the last one - a chicken stew - being a closing celebration. At the end of the day, Pastor Rebecca of the team was asked to bless the house and David. Then he was asked if he had anything to say. The man spoke so clearly and articulately! He thanked everyone involved and praised God for His goodness to him. One of the pastors told Marty that there would be women lining up at his door hoping the man would marry one of them just so they could have such a good house! In the past no woman would have anything to do with him because of his mental state. The male relatives from his compound sat in chairs the whole day watching the house-building from the beginning and were totally amazed that people would come together like that, build a habitable house in one day, and just give it to the man. That is what has the whole community amazed as well. You can see his relatives and other onlookers in the background of the above photo. 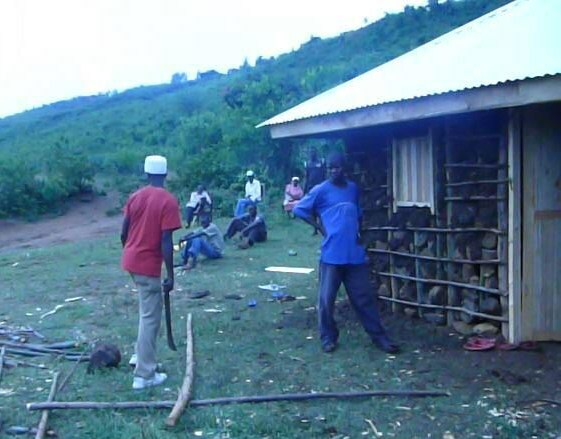 Also,the onlookers and the locals who had come together to build the house were rather taken aback that the team - mzungu (white) foreigners - were hunting and carrying rocks to the site and were in the mud up to their ankles (and elbows) helping to fill in the walls. 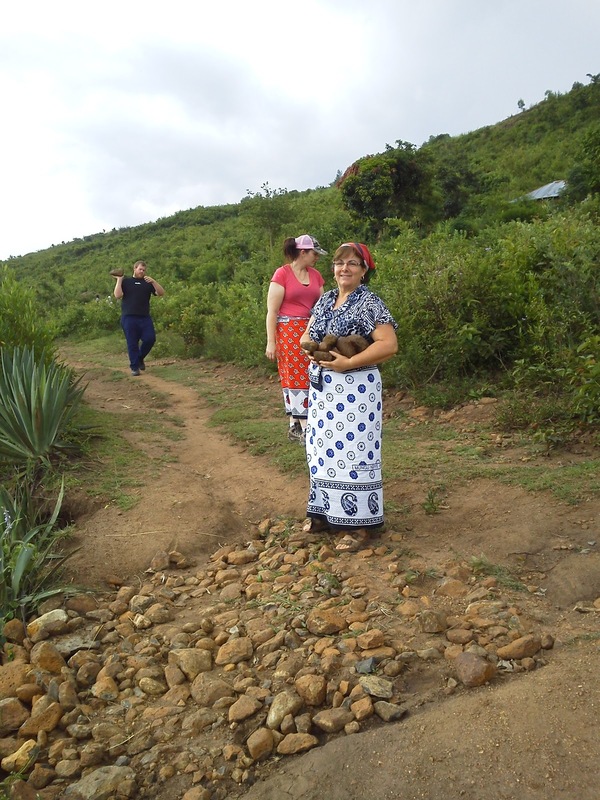 One of the pastors said he overheard one of the local women chastising other women there that if the wazungu (plural for mzungu) could haul rocks and fill the walls then they should be doing as much. So there you have it - that is why people are saying "That house is the Gospel". Three of our team members went into two of the secondary (high) schools in the village to talk with the students about what they do back in the USA. Josh is a policeman - the kids loved that and had many, many very good questions for him. Two interesting ones, that gave him pause to think, were: What type of legacy do you want to leave to your children, and how do you handle mob justice in the United States? Don, is a senior, retired engineer from an electricity utility. He is married to a woman from Thailand, spends much time there and does a lot of work with children in that country. Theschool kids were really interested in the photos he had of children and his family in Thailand, and stories about the culture. Natalie is an airline pilot. All three spoke so well, sharing their experiences and photos. Although these are village schools, they are turning out university-level students. We were impressed at the questions these youngsters asked; it made it clear that they are not just learning academics, but are being taught to think as well. When Natalie got up to speak she had on a hooded sweater. She took it off and revealed underneath, her pilot's uniform. Well - the reaction, especially from the girls, was really great when she told them what she does for a living. It is common for kids to have aspirations to be doctors, lawyers or even teachers. But the very thought of being a female airline pilot was nowhere in their paradigm. Now, you can be assured, there are many girls in that village whose desire for education has increased and who will aspire to become airline pilots. Not only were the children challenged, but so, indeed, were the speakers. It was a good day! One infant that we sent to hospital directly from the clinic was in serious danger of perishing. She was put on life support and, thankfully, responded. The baby had to stay in hospital until a few days ago, but it is now home and well. The church in Florida that sent the team, Venetian Bay United Methodist Church (V-Bay UMC) was wholly involved in the mission, and many provided finances for the mission, and some, specific items. Money was provided to make new dresses for 35 destitute widows. Destitute is a relative term out here. However, a widow qualifies as "destitute" if she is past child-bearing age, has no source of income, has no children who can take care of her, and is of good reputation in the community. RCC has identified 35 - within the church, and the general community with the help of the chief. Marty and Sarah - a tayloress from RCC - went shopping in Kisumu, the nearest city, for fabric for 35 women. Then Sarah took the fabric to her shop - El Shadai Enterprises - and with list of widows in hand, systematically called each lady in to her shop, took their individual measurements, showed them the fabric so that they could choose the one they wanted, and then showed them various styles/patterns to choose from to have their dresses custom made. The really older ones chose conservative one-piece styles, whereas some of the ones not as old chose more contemporary two-piece dresses. There are no two dresses alike. We weren't able to give them all out in one day, but we have photos of some of them holding their dresses up to themselves. How sweet it was. Blessings and Peace to Each of You.